Join Rabbi Avi and Faigy Zwiebel and family for a festive and relaxing Friday Night Shabbat Dinner. The traditional meal includes everything from Kiddush to Dessert, Challah to Soup, Salads and a main course, plus singing, shared words of Torah and friendly shmoozing. Everyone loves Faigy's cooking and can't wait to come again! 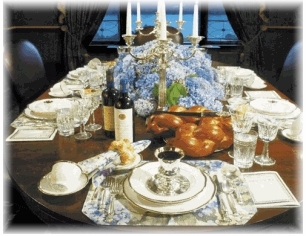 We love guests and enjoy celebrating Shabbat with others. Give us a call or email, and we'd be delighted to have you. Although dinner is free, donations are appreciated to help cover the expenses.